On Paper presents new works by Lee Machell, an artist whose practice is primarily sculptural. 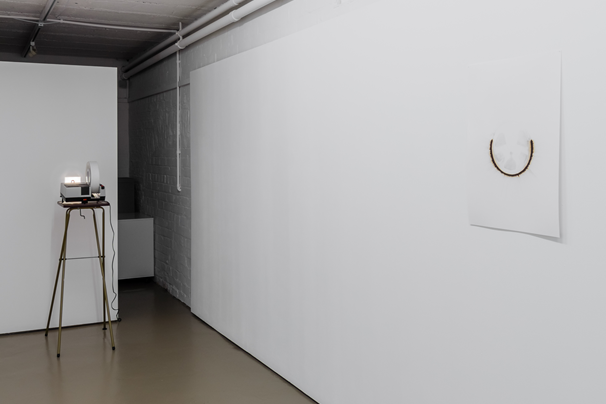 Machell situates his practice within a vocabulary of commonplace objects which he invests with the status of sculpture. In On Paper each work's inception is an object which Machell, with minimum intervention, uses to create works which synthesize the various elements of his practice. 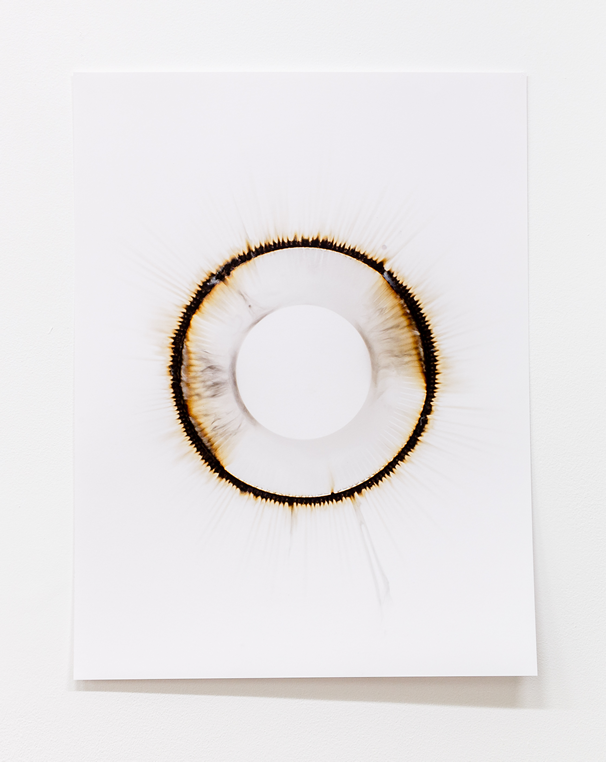 In an extension of Machell's site-specific installations in which he uses lit matches to create an ephemeral line that cuts across the wall(s) of a space, On Paper presents Machell's experiments with this process in its permanent iteration – works on paper. 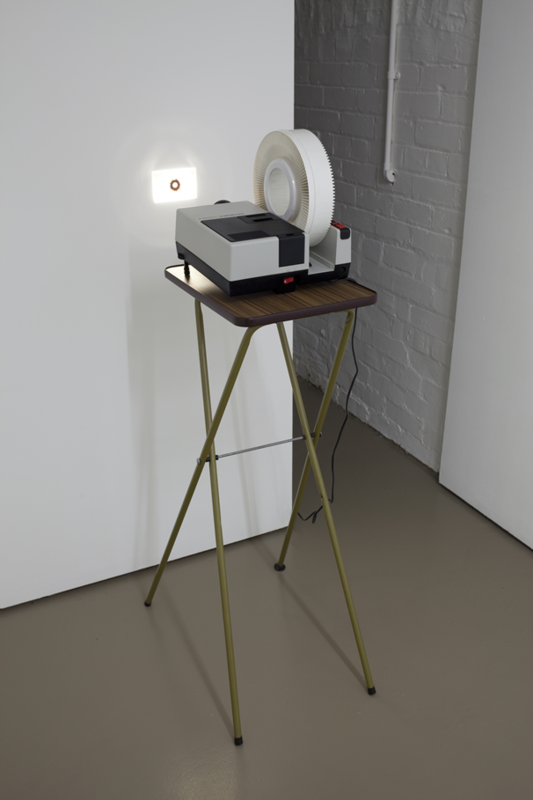 The objects Machell adopts in his works mostly pay reference to the various accoutrements of the studio, such as a slide carousel in Hanimex (2015). Each object's choice is a selective process in which Machell ascribes importance to its shape, such as the slide carousel in Hanimex whose cavities allow the smoke to expose its empty slots. The works in On Paper elicit an oblique allusion to sculpture. 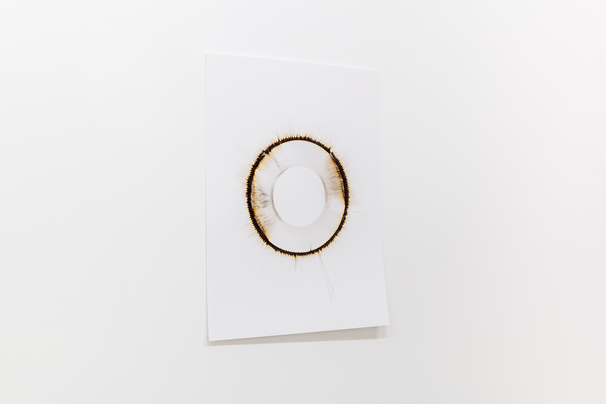 In Hanimex, Machell encircles the object with matches; once lit, a sequence of sparks chart its shape and the smoke captures its impression on paper. In his works Machell plays with the paper's physicality, its state as a combustible material. Paper's molecular structure as primarily carbon allows it to char easily when set alight; also, chemicals in the match create tonal nuances and the smoke allows unpredictable patterns to evolve. 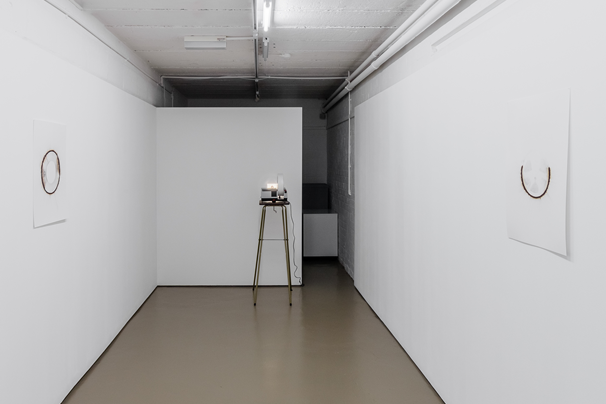 On Paper introduces Lamp Black (2015), a work which reveals the imperceptible object in Hanimex. 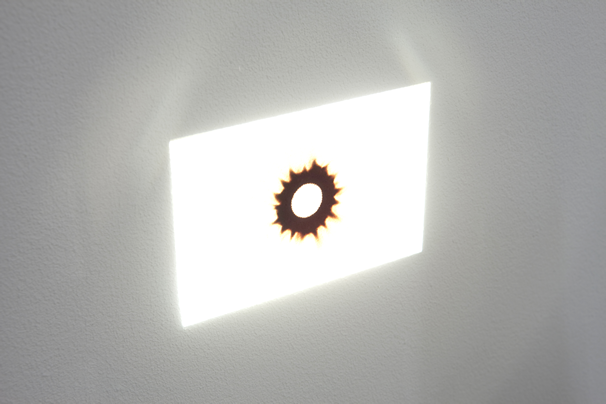 Lamp Black comprises a Hanimex projector which screens a slide onto the wall. As a subtle continuation of Machell's experiments with matches, Lamp Black is a work which maps the outline of an oil paint tube's screw cap on paper. 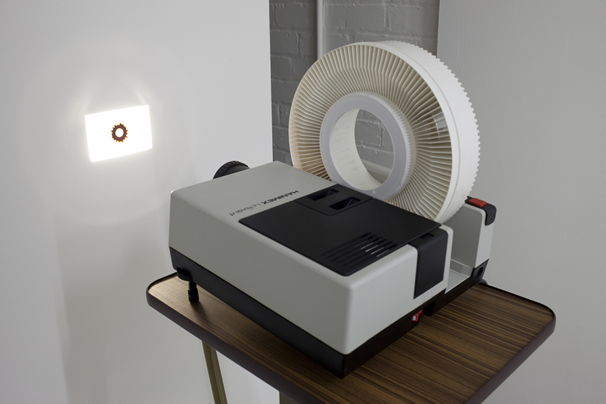 Machell then recasts it as a slide which the Hanimex projects onto the wall at the object's actual size. Lamp Black unites the main concerns of Machell's practice; mainly its object centric sculptural statements and experimentation with matches. In On Paper Machell continues a succession of experiments with combustion which include Yves Klein's Fire Paintings (1961), Alberto Burri's "Combustioni Plastiche" works, and John Cage's River Rocks and Smoke series. Unlike Klein, Burri, and Cage, Machell uses matches as his combustible material in order to create an imprint which marks the object's presence in its absence, an act that expands the sculptural narrative inherent in his practice. 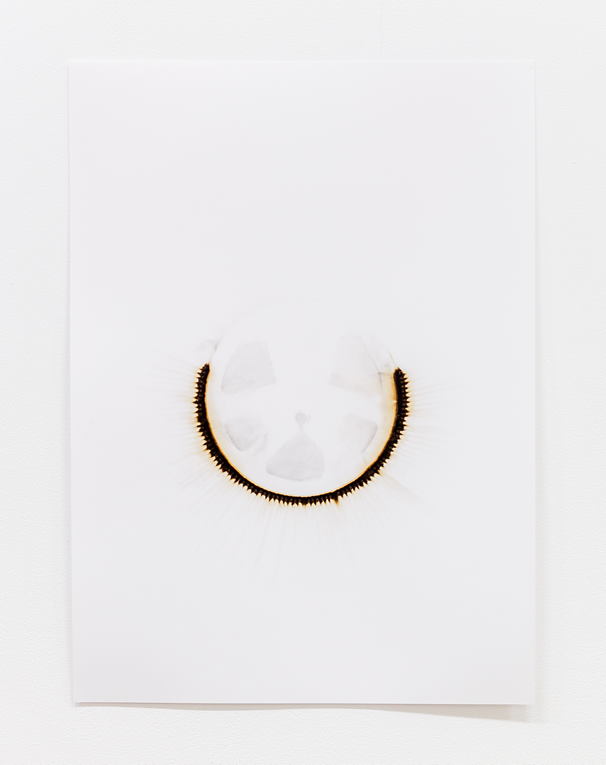 Machell's works eschew intentionality as the materials prescribe a work's outcome; in Hanimex each match creates a unique mark on the paper. As such, Machell unleashes the volatile nature of lit matches in a process in which the work's creation results in the object's destruction. Lee Machell [BA (Hons) Visual Arts, University of Salford (2005)] is represented by OBJECT / A, Manchester. Forthcoming exhibitions include Nevertheless (2016), A3 Project Space, Birmingham, and Transparent Things (2016), Vane, Newcastle. 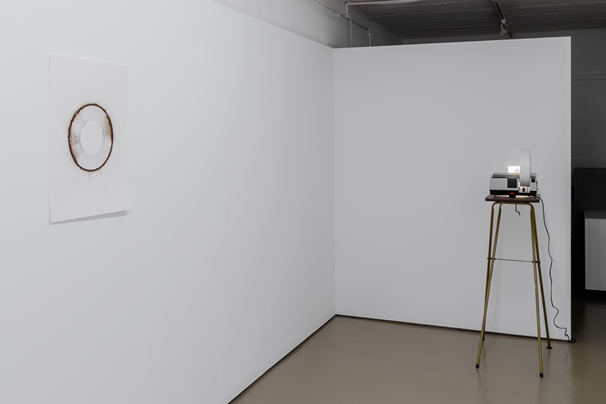 Recent solo exhibitions include Detail (2013), Supercollider | Contemporary Art Projects, Blackpool; and Interruption (2013), Platform A, Middlesbrough.